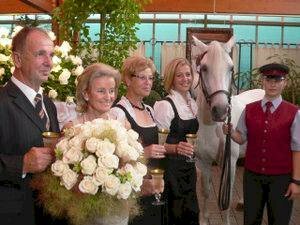 On Thursday, July 2nd, 2009 the first Lipizzaner Rose was presented at the Rose Temple by the nursery Micko. Elisabeth Gürtler, Managing Director of the Spanish Riding School – Federal Stud Piber and an avid rose lover and representative of the noble Lipizzaners is the proud "god mother". The Lipizzan stallion Maestoso Ancona, born on April 7th, 2000, calmly supported her and delighted the audience. He was allowed to sniff the wonderful rose scent and would have liked to taste it too! And just like the famous Lipizzaners, the Lipizzaner Rose doesn’t turn completely white until it blossoms; its bud is delicately pink. The Lipizzaner Rose reaches a height of approx. 90cm and belongs to the family of premium roses. It flowers repeatedly and is very resistant against diseases, just as its name giver the Lipizzaners.